Happy Groundhog Day 2013. Will Ohio's Buckeye Chuck see his shadow at sunrise this morning? Will Buckeye Chuck see his shadow at sunrise this morning? Buckeye Chuck is the groundhog in Marion Ohio. If the Groundhog sees his shadow he goes back into his burrow for 6 more weeks of winter. If the groundhog does not see his shadow he stays out and we get an early spring. Neither rodent will see their shadow? Early spring all around. According to Stormfax.com and earthsky.org Punxsutawney Phil has only been correct about 39% of the time. 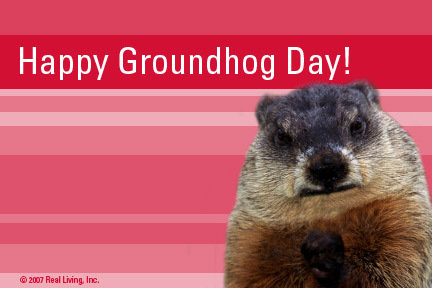 I believe I read last year that Buckeye Chuck is more accurate than Punxsutawney Phil. The Buckeye Chuck tradition is not as old as the PA tradition. Last year Punxsutawney Phi got it wrong. As I recall Buckeye Chuck got the early Spring right in 2012. We have had a more wintry winter this year but I could still go for an early Spring, personally. Reading about Groundhog Day on Earthsky.org they said there should not be more than one weather groundhog. To paraphrase, Punxsutawney Phil should be it. Should we only have one national weatherman too? I read Canton, Ohio got their own groundhog. Perhaps the Columbus Zoo needs their own groundhog? Marion, Ohio is close enough for me. The graphic is a Real Living ecard produced in 2007. In 2002 HER Realtors formed Real Living with two other Ohio real estate brokerages. The Real Living real estate franchise was based in Columbus, Ohio. In late 2010 or early 2011 the real estate franchise (Real Living) was sold to Brookfield Financial Services in Canada. In late 2012 HER Realtors became disenfranchised… no that means something else. In late 2012 it was announced we were leaving the franchise, the Real Living name will go away. It’s complicated.